What I’m saying is: these cookies are incredible. 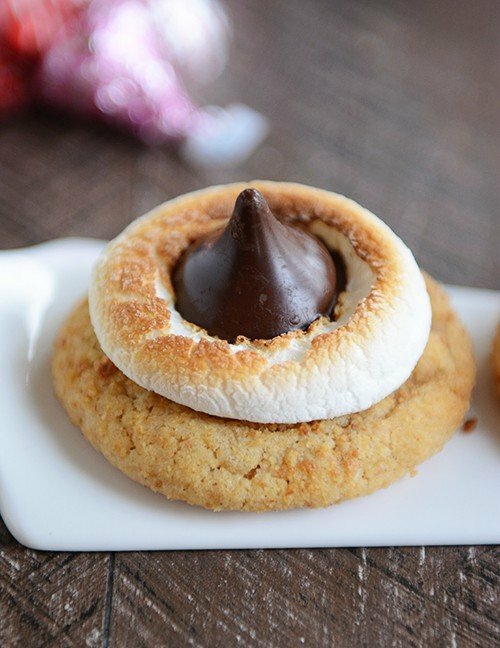 A riff off the classic peanut blossom cookie, these babies start with a soft graham cracker cookie and end with a hershey’s kiss while a soft, smooshy toasted marshmallow pushes it’s way into the middle. Yum. I’m kind of an on the fence marshmallow cookie girl but I’m pleading with you to find a way to get these cookies in your life as soon as is humanly possible. I’m willing to bet most people would choose to eat one of these out of a lineup because they’re adorable. But after one taste, they’ll know. There’s definitely more than just looks going on here. These s’mores blossom cookies are special.